These paintings are most likely companion pieces, reputedly copied by the Edinburgh-based artist, Anne Forbes, after an original by Godfrey Kneller. 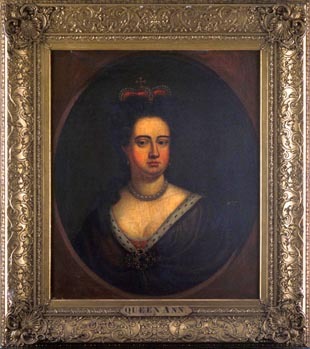 The failure of Queen Anne and her consort, George, Prince of Denmark to produce a living heir was one of the underlying causes of the Anglo-Scottish Union. Anne was the second daughter of King James VII and II and, unlike her father, was a committed Protestant. Her marriage to George produced no less than seventeen pregnancies; however only one child, William, duke of Gloucester lived for any length of time. 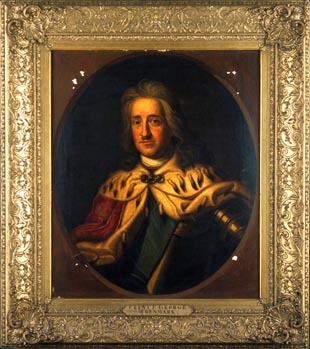 His death in July 1700 from smallpox meant there was no Protestant heir to succeed Anne in the event of her death. The English parliament's apprehensive response was the 1701 Act of Settlement which decreed that, upon the death of the queen, the throne would pass to a Protestant German dynasty, the Hanoverians. The Edinburgh parliament's refusal to accept the Act prompted Anne and her English and Scottish ministers to push for a full incorporating union. George did not long survive the creation of Great Britain, dying in 1708. Anne lived on through the turbulent first years of the new Anglo-Scottish settlement. Her death in 1714 heralded the arrival of the Hanoverians.